From viral marketing to computer viruses, the cultural logic of virality permeates the Web. The December 2010 issue of the Sage journal Body & Society will publish my long-awaited 36-page essay “A History of Virulence: The Body and Computer Culture in the 1980s”. The text that follows is the second part of the “author’s cut” version of the article: an archeology of computer-mediated moral panic, autonomist marxist hacking, and AIDS activism. Click here for the first part. Computers – Viral or Visceral? This ‘viral turn’ in mainstream computer narratives was absorbed in a somewhat paradoxical way into users’ milieus. The symbolic coincidence of the body and computing machinery, as well as the related viral motives, were enthusiastically adopted by computer amateurs. This appropriation can be read as a typical ironic strategy mirroring hegemonic taxonomies (Ang, 1985; Storey, 2006), a way of transcending labelling through self-stigmatization. In this sense, virulence developed into a cultural process of unapologetic ‘counterpride display’ typical of youth subcultures (Richards, 1988). In the context of 1980s computer culture, this can be interpreted as something that aimed not only to empower autonomous social practices through political recognition but also to normalize personal motivations and behaviours through the inscription of technological activity in the intimate sphere of the body. The mimicking of the media hype was not only performed with satirical intent. It also performed a deliberate distortion and amplification of the viral discourse into one of ‘viscerality’. The classical Cartesian superposition between body and machine – implied by the mainstream rhetoric of computer viruses – expanded into a thematic sequence that came to be dominated by the image of the machine penetrating the body. Understanding how computer culture adopted the stigma of being a ‘virus’ and turning it into an asset requires first understanding the relative place and status of the computer in late 20th-century consumer culture. The process of miniaturization of computing technology that had led from the 13-ton UNIVAC (1951) to the 30-odd kilo IBM 5100 (1975), was also a process of re-territorialization. While the post-war ‘electronic giant brains’ (Berkeley, 1949) occupied military bunkers and industrial basements, the 1980s saw the infiltration of computing machines into the private sphere. Decades before ubiquitous computing, homeand family-computers took up residence inside the houses of a new generation of electronic amateurs1. Commercial names changed in step, evoking everyday life and homely informality. The most successful products had common male and female names like Lisa or Vic2. They conjured up the unthreatening pleasures of family life: children (Junior, Piccolo), small animals (Pet, Bee), and fruits (Apple, Acorn, etc)3. Products designating power, luxury and imposing size were destined to sell poorly4. Specialized press targeting computer users developed these motifs. Home privacy became synonymous with personal, bodily intimacy. In the media, there was an increasing trend to emphasize the association between autonomous computing and bodily performance, beauty and health. The well-known Apple 1984 TV commercial (Scott, 1984)5, for example, staged the liberating power of personal computers by opposing a young female athlete to a crowd of senile users living under the rule of an Orwellian Big Brother. These initial remarks are corroborated and extended by the analysis of visual sources. At first glance, the depictions of computers associated with sports and physical activities duplicate this buoyant bodily imaginary. For example, Figure 2 clearly places the computer in a family setting. The presence of a father and his son suggests intergenerational unity and family ordinariness. 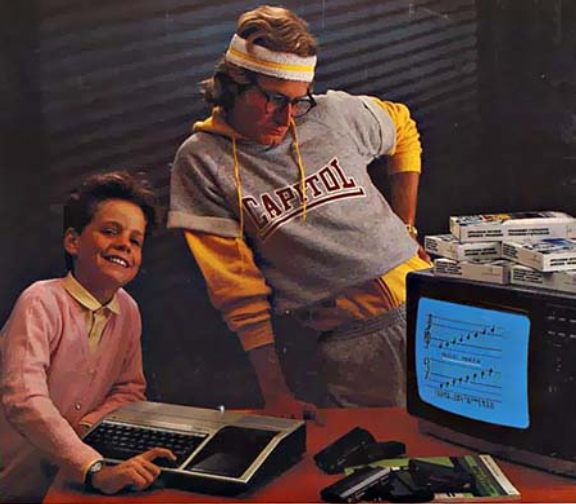 The father wearing sports gear further indicates that computing can be seen as a substitute for physical exercise. From viral marketing to computer viruses, the cultural logic of virality permeates the Web. The December 2010 issue of the Sage journal Body & Society will publish my long-awaited 36-page essay “A History of Virulence: The Body and Computer Culture in the 1980s”. The text that follows is the first part of the “author’s cut” version of the article: an archeology of computer-mediated moral panic, autonomist marxist hacking, and AIDS activism. Click here for the second part. The emergence of ubiquitous media and the focus on pervasive computer networks seem to have introduced a major shift in the way information and communication technologies are practised and represented in contemporary societies. Since the early 2000s, the consensus around theories of a virtual humanity ‘homesteading on the electronic frontier’ – the ethereal cyberspace where users were to be ‘uploaded’ (Lévy, 1994; Rheingold, 1993) – have progressively given way to approaches to computer-mediated social interaction centred on mixed realities. According to these new theoretical stances, digital technologies are to be regarded as a domain of affordances extending and enhancing physical presence rather than superseding it (Hansen, 2006). Significantly enough, the author who popularized the very notion of ‘cyberspace’, William Gibson, acknowledges this momentous development in his novel Spook Country: if the pre-ubiquitous technological paradigm can be described as ‘a state in which ‘‘mass’’ media existed, if you will, within the world’, in the ubiquitous one they ‘comprise it’ (2007: 121). Ubiquitous computing does not transcend everyday experience, rather it pervades reality by saturating the actual space of the cities and by infusing physical bodies. Featherstone (2007: 320) describes this media ontology by suggesting that ‘as media become ubiquitous they become increasingly embedded in material objects and environments, bodies and clothing, zones of transmission and reception’. After Simondon, Bernard Stiegler defines social and ubiquitous media as a ‘human techno-geographical milieu’ (in Venn et al., 2007), that is, a socio-technological process converting human corporeality into information. Following Stiegler’s emphasis on the need to harmonize symbolic, technical and material milieus, new couplings of the body, social imaginaries and social practices come into view. 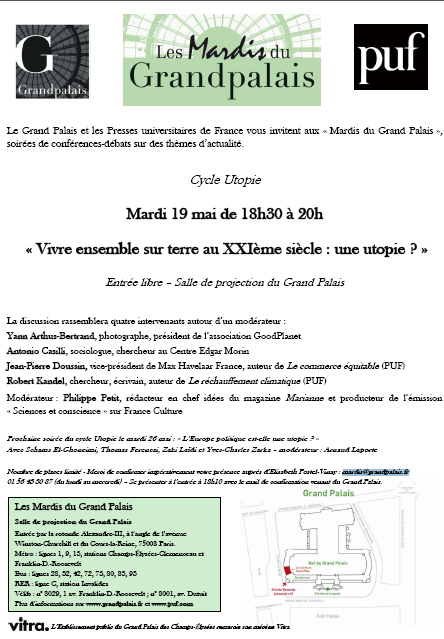 J’ai été invité à intervenir dans une conférence-débat dans le cadre du “Cycle Utopie” des Mardis du Grand Palais, organisée par les Presses Universitaires de France. C’est pour mardi prochain, 19 mai 2009, de 18h30 à 20h. C’est justement pour améliorer la qualité de la soirée que je vous invite à y participer. Si cela vous intéresse, vous trouvez ici le dépliant avec les renseignements pratiques. L’entrée est libre mais le nombre de places est limité, donc merci de confirmer impérativement votre présence auprès d’Elisabeth Postel-Vinay : mardis@grandpalais.fr.